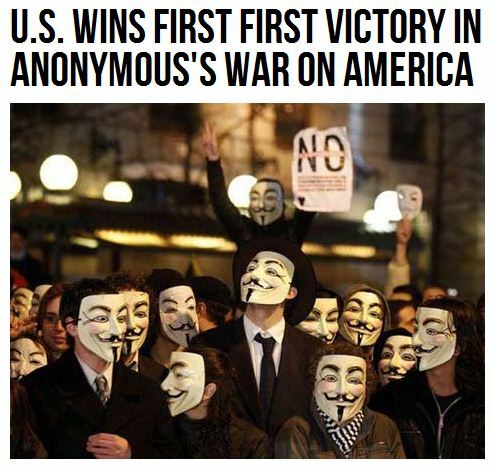 ANONYMOUS NOT SO AFTER ALL, SIX CHARGED BY US AUTHORITIES FOR COMPUTER CRIMES……. – The Tundra Tabloids……. ANONYMOUS NOT SO AFTER ALL, SIX CHARGED BY US AUTHORITIES FOR COMPUTER CRIMES……. These punks needed taking down. So, lets be clear, they give themselves a name under which anyone can co-opt and create havoc, and the bill will be forwarded to anyone within the anonymous movement. If I were them, I would be very nervous right now. (Reuters) – Six suspected leaders of the international hacking organization known as Anonymous were charged by U.S. authorities of computer crimes, dealing a major blow to the loose-knit group that has wreaked havoc on the websites of government agencies and major corporations. Among those charged was Hector Xavier Monsegur, known as “Sabu,” who took responsibility for attacks on the websites of eBay’s PayPal, MasterCard Inc and Visa Inc between December 2010 and June 2011, according to federal prosecutors and the FBI. The attacks were in retaliation for the refusal of those companies to process donations to Wikileaks, the group that leaked confidential diplomatic cables in 2010. The charges against Monsegur, in a case that was opened last summer, were filed in federal court in New York via a criminal information. Such a document typically means a suspect has been cooperating with the government. “Sabu was seen as a leader … Now that Anonymous realises he was a snitch and was working on his own for the Fed, they must be thinking: ‘If we can’t trust Sabu, who can we trust? '” said Mikko Hyponnen, chief research officer at Finnish computer security company F-Secure. Previous Post Previous Post US SHERIFF OFFERS FORENSIC EVIDENCE THAT OBAMA’S LONG FORM BIRTH CERTIFICATE WAS FORGED……. Next Post Next Post COPT PRIEST SENTENCED BY EGYPTIAN COURT TO SIX MONTHS IN JAIL FOR EXCESSIVE CHURCH HEIGHT……..